Are your lips dry and chapped from this harsh winter? Mine are, and I’m tired of paying $3 a tube for chapstick, so I made my own! It’s way simpler than you would think, and it comes out to about $1.03 per tube. Plus, you know exactly which ingredients are in your chapstick, so you can be sure it’s 100% natural! So what are you waiting for?! 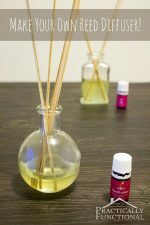 This tutorial will show you how to make homemade chapstick, in any flavor or scent combination you want! 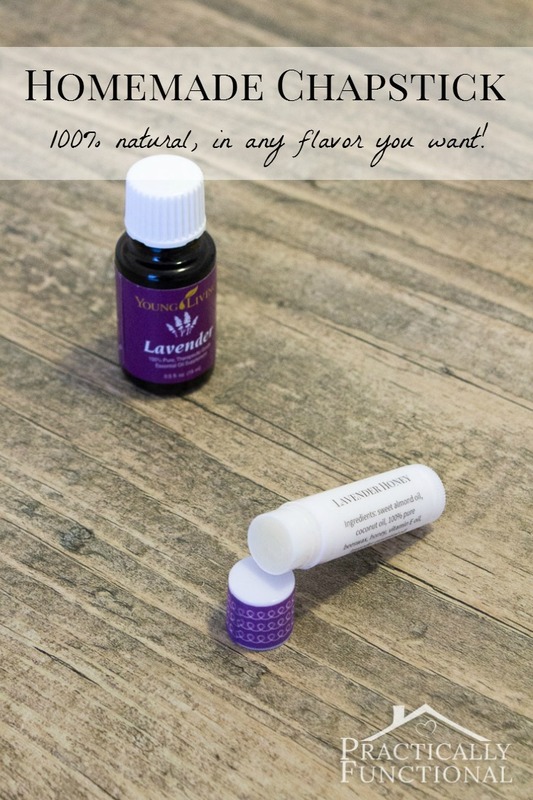 I made Lavender Honey chapstick for my first batch, but you can easily modify the recipe below to add your favorite flavors instead! This recipe will fill about 10 empty chapstick tubes. 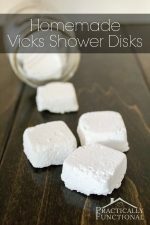 The first four ingredients are the basics for making homemade chapstick. If you want a basic, unflavored, unscented chapstick, just make the recipe below without the essential oil and honey. Or if you want flavors other than lavender and honey, just switch them out! The 8 drops of essential oil and 1 teaspoon of honey are just for flavoring, so feel free to substitute them as you wish; if you leave out one or the other or both, your chapstick will still harden up and turn out perfectly fine! In a double boiler, heat the coconut oil, almond oil, and beeswax until completely melted. Remove from heat and quickly whisk in the vitamin E oil, essential oil, and honey. 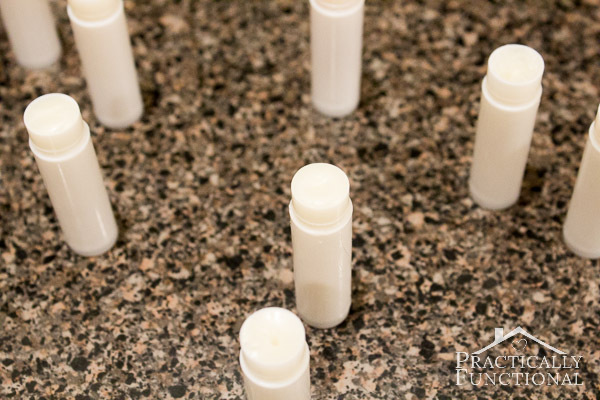 As soon as the honey is fully incorporated, quickly fill your empty chapstick tubes or tins. Use a small funnel or a disposable plastic pipette to fill your tubes; it’s way easier than trying to pour it straight out of the pan! NOTE: This part can be a little tricky because honey mixes better when it’s cool, but of course, once your oil mixture cools, it will start to harden up. Just work fast, stir frequently, and whisk the honey in as best you can. If your oil mixture hardens up before you can finish pouring it, just put it back in the double boiler for a quick minute. It’s better if you can do it all in one go without reheating, but if you can’t, don’t sweat it! Let your filled tubes or tins sit for at least 3 hours so they can harden up. I used Young Living’s lavender essential oil, which is probably my favorite of all the ones they make; it’s so versatile! 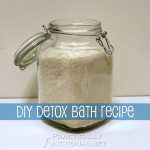 It’s great for helping you relax (I’m definitely making some lavender bath salts next! 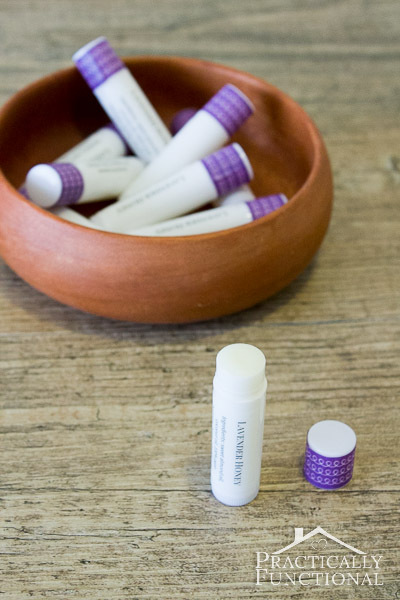 ), and it helps heal chapped, dry skin, minor burns, and itchy bug bites, so I knew it would be great in this chapstick! « 10 Delicious Summer Berry Recipes! I love the chapstick Jess, thanks!! Also the allergy trio is working great. Whoo-hoo! Do you sell these and how do I order? Thanks. Yay! So glad to hear it’s working! I’ll call you later today once we’re done gardening! where did you find the Chapstick tubes? I found mine on Amazon; there are tons of options as far as color, style, and quantity on there! LOVE your lavender and honey combo, Jessi! Lavender is definitely my favorite Young Living oil! I keep seeing so many awesome uses for essential oils, but my understanding is that most of them are toxic to cats. I worry about cleaning with them or making a chapstick & kissing the cat… Any thoughts on that? Great question Kristy! Yes, you definitely need to careful with essential oils around cats because their bodies process things in a much different way than we do (or even than dogs do; there are a lot of oils that are ok for dogs but not for cats). Citrus oils are especially dangerous, but there are others that are definitely safe, and lavender is on the safe list as long as you dilute it enough. As far as having essential oils in chapstick on your lips and then kissing the kitties, I think it’s probably fine because the oil is so diluted in the chapstick recipe, then it’s diluted more as it soaks into your skin, so I imagine it’s trace amounts if any that would transfer to a cat that way. And especially if you’re using lavender like in this recipe, because that’s an oil that is safe for cats. If you used orange or lemon I would be a little more careful. This site is a really great resource for more info about using essential oils with cats, and they explain which specific oils are problematic and which oils are safe, and why you need to be careful around cats. http://www.experience-essential-oils.com/essential-oils-for-cats.html Hopefully that helps! Oh, and as far as cleaning with them goes, I think that’s another one where it’s ok as long as you exercise caution. For example, I often diffuse lemon essential oil because I love the way it smells, but lemon is a citrus which is not good for our two kitties. So I make sure that they have the ability to walk out of the room. Their noses are much more sensitive than ours, so if they don’t like the smell, they will just leave. Same idea for cleaning. As long as you aren’t cleaning the house head to toe all in one go, if there is a place the kitties can go to escape the oils and the smell, they should be fine! Thank you so much for this recipe; I am NEVER without chapstick. It’s kind of my claim to fame! Would you mind giving me insight on how did you labeled the chapstick tubes? Can you use olive oil instead of the sweet almond? I’d like to make this for my daughter but she’s allergic to tree nuts. What’s the shelf life of the chapstick? I don’t know for sure, but I made it three months ago and all the tubes I made are still intact! I imagine it has a long shelf life, like most other chapsticks. Just don’t store it anywhere too warm or it might melt! I have the YL Lavender oil, and I have coconut oil, vit E oil, and honey… but those are the only 3 ingredience that I have off of your receipe:( Will this work, or do I need the beeswax and the rest of it?? You definitely need the beeswax Monique, otherwise it won’t harden up! The first four ingredients (coconut oil, almond oil, beeswax, and vitamin E oil) are the basics for chapstick, and the other ingredients are just for flavoring or scent, but you need those first four or it won’t set correctly. I like in Okinawa, Japan. It is hot a humid all the time. Does the chapstick soften/melt when warm since the coconut oil is in there? I haven’t had it melt just because of heat and humidity in the air (we live in Chicago, so it gets quite hot and humid here in the summer too), but I have noticed it softens a little if I put it in my front pants pocket and carry it around that way. My body heat seems to soften it if I carry it that way, but it hasn’t softened just from being left out in a room during the summer when it’s hot. If you’re worried about it you can always add a little more beeswax to the mix to help make it harder! I’ve been looking for a while for a lip balm recipe. Every one that I see asks for beeswax but doesn’t mention if the mesurement is in soild of liquid form. Or does it not matter? Thanks! Usually the measurement is in solid form. But you want it pretty well packed in, so if you’re using pellets it’s easy enough to measure a tablespoon etc. but if you are grating a larger beeswax block down and you get the little fluffy grated pieces, make sure you pack them into the tablespoon measure pretty well so you aren’t measuring a bunch of air along with it! how many tubes did you end up using with this recipe? This recipe fills about ten tubes. If I don’t have a double broiler, what else can we use to melt everything together? You can make your own double boiler with a pot of water and an empty tin can, or a glass bowl! The point of the double boiler is just to not put direct heat on the chapstick ingredients. I used a glass mixing bowl and just put all the ingredients in there, then set the entire bowl in a pan of water and heated the pan. The ingredients melted as the water in the pan got hot, but the heat from the stove was heating the water, and the water indirectly heated the ingredients. Hi. Where did you get the labels for the chapstick? I printed them myself on an Avery label! Which Avery label did you use? Thanks! It’s just the regular address label, but the clear version instead of the white. I think the number is 18660. I was to make these chopsticks for a demonstration in class, but will only have a microwave available to heat ingredients. Will it still work? I’ve never tried melting it in a microwave, but it might work! I would just double check the melting instructions on the label of whatever beeswax and oils you get and see what they say. Love the recipe, but my first batch at room temperature is not firm or solid enough to suit me. Next time, I will use more beeswax. 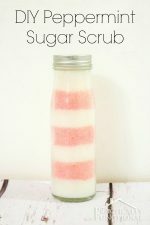 I flavored with Lavender Oil and raw honey but will do Peppermint on the next. Adding more beeswax should definitely help firm it up! If we wanted to make a Vanilla Mint version, could we substitute the 1tsp. Honey for 1tsp. Vanilla Extract? Would it still set up properly? That should work! If you’re worried about the consistency you can add slightly more wax and that will make sure it sets properly. Let me know how it turns out! Wow! Love the way my lips feel!! Perfect recipe!! Thank you so much. My lips stay protected longer and are much softer. I’ll never buy store brands again! 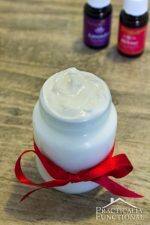 Lovely, easy-to-follow recipe for lip salve; and all natural ingredients. Makes a lovely gift idea; thank you. Hmm, all of the ingredients are different consistencies, so they need to be hot in order to mix, so maybe they cooled down too much as you were filling the tubes. You could try just filling a few and then reheating everything and stirring really well to make sure there’s a good mix in every tube. I don’t think raw honey would make a difference over processed, but I don’t know for sure. How did you do the adorable labels? I am going to make some for a class and would love to make some great labels. I just printed them on regular Avery clear address labels! Instead of the YL lavender essential oil, I wonder if I can use a lavender infused (into sunflower) oil? I used dried lavender from my garden, no pesticides of course, to make the oil. And if I can, would I use the same amount of 8 drops? You can use whatever essential oil you’d like! The point of it is to just give it some flavor and scent, so yes, I’d start with 8 drops and see if it smells strongly enough for you. If not, you can always add more!